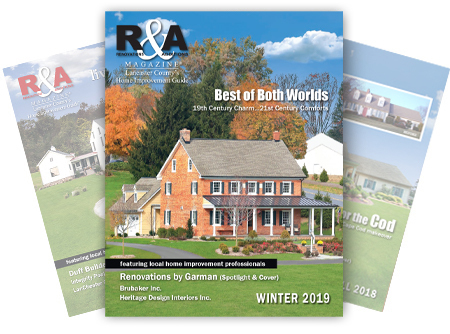 R&A Magazine is a free consumer publication dedicated to providing valuable home improvement information to Lancaster County’s current and future home owners. What most distinguishes R&A Magazine from its syndicated counterparts is the magazine’s editorial content. Rather than articles written by nationally syndicated authors, the bulk of R&A’s content is contributed by Lancaster County’s own home improvement professionals. Readers are introduced to and learn from the area’s finest, who share their local experiences and expertise on projects completed here in our own back yard. Published quarterly, R&A Magazine can be found at numerous Lancaster County locations. Whether you are contemplating a home renovation, an addition or some other home improvement project, or simply enjoy reading about them, we hope you find our magazine enlightening and enjoyable. To contact any of our advertisers including those who have been featured as a contributing author, we invite you to visit our Advertiser Index. If you are interested in advertising in R&A Magazine, click here for Ad Rates & Sizes, or for more details about the magazine, see our Media Kit.